4 Wedding Games to Make Your Wedding Reception More Fun For Free! When it comes to planning the wedding reception, whilst some of the finer details may be interchangeable, one thing remains clear; we all want our guests to have fun. Whereas most guests will enjoy just relaxing in the conversation and atmosphere of your special day, it can always be a fun idea to add a few games for extra entertainment. So what games can we add? 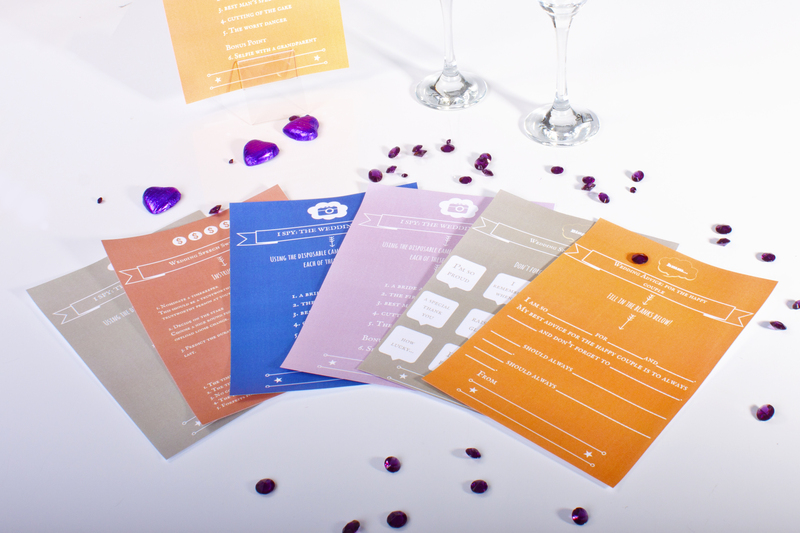 Well, without breaking your bank balance, we have created four printable wedding table games that range from fun for kids to potential table riots; all of which can be downloaded and printed at your leisure. 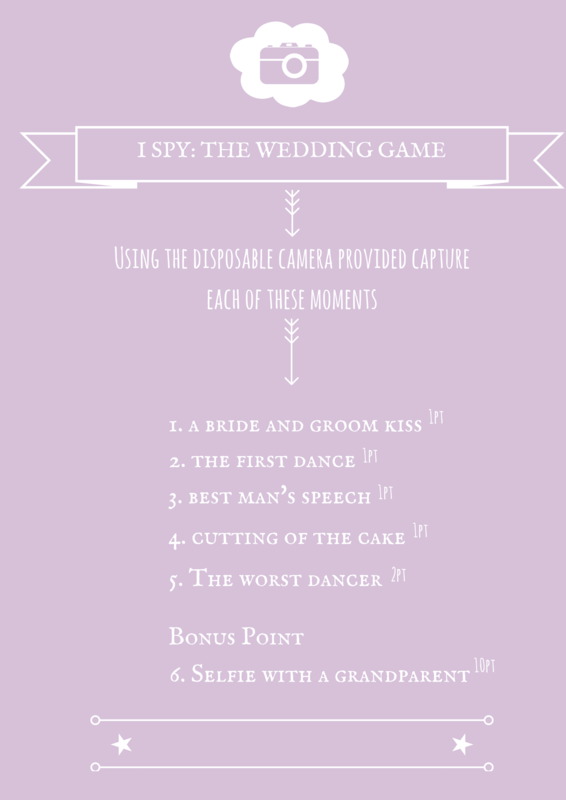 For a simple game that is both fun for guests and great for your photo album, look no further than the I SPY wedding game. In addition to making a great impression with your guests, a disposable camera is fun way to ensure that you capture hundreds of iconic wedding moments that the professional photographer may otherwise miss! Just because you’re getting married doesn’t mean that you have it all worked out in the relationship department yet! In addition to being a hilarious read during your post-wedding jitters, the wedding advice game offers you the chance to take some key insight from family and friends who have walked down the path of marriage before you. 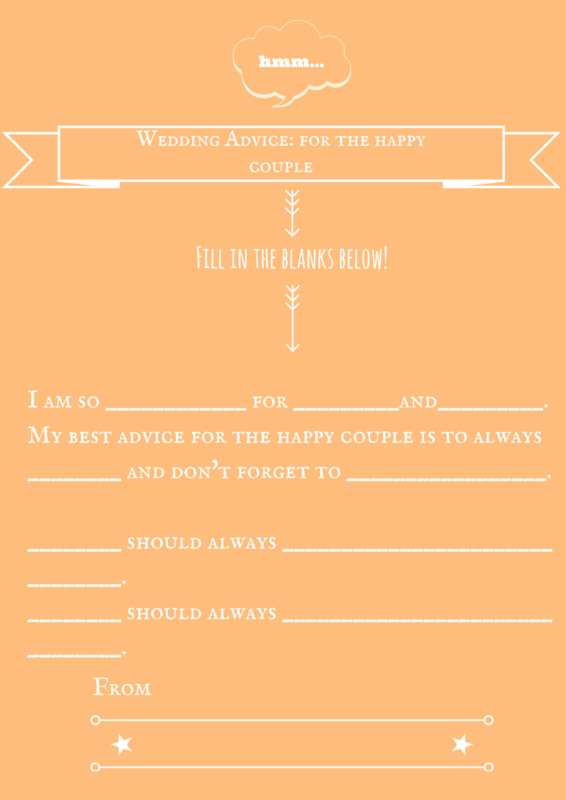 Download your free copy of the Wedding Advice for the Happy Couple here. Ok, let’s take a trip back in time. Imagine that first wedding you attended, remember the speeches – specifically how long and confusing they seemed. Not much fun. Now picture that same child except with this fun wedding bingo game. Much more exciting, aye? Give the kids something fun to occupy their time by leaving out this fun game of wedding bingo. Make sure to have a prize ready for the little one who stays strong and gets all the answers! 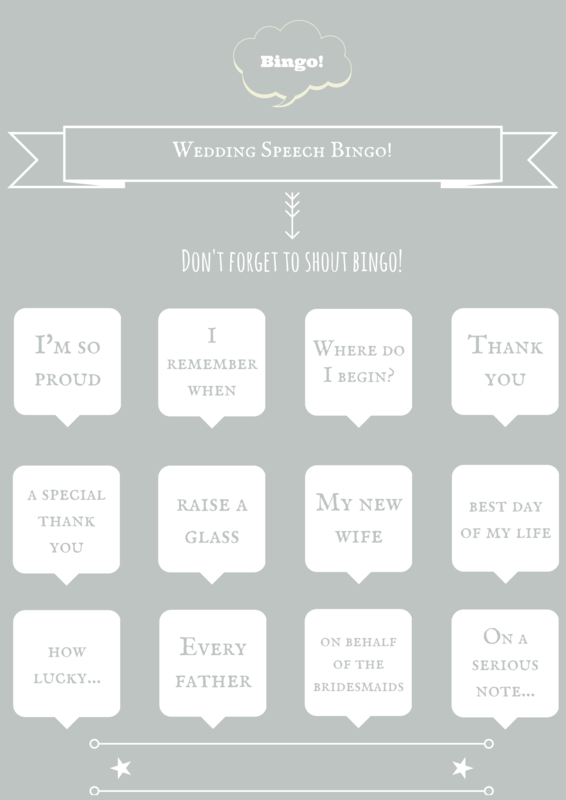 Download your free copy of Wedding Bingo here. 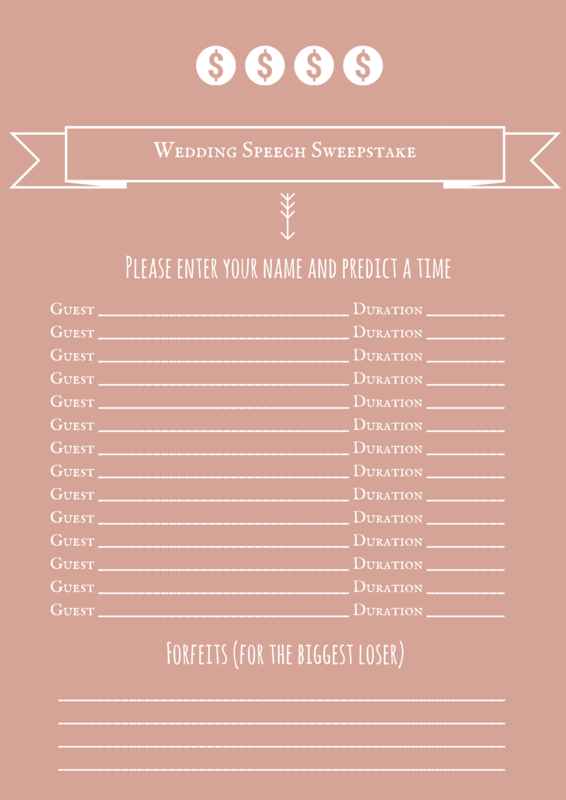 Download Part 1 of the Wedding Speech Sweepstake here. Download Part 2 of the Wedding Speech Sweepstake here. 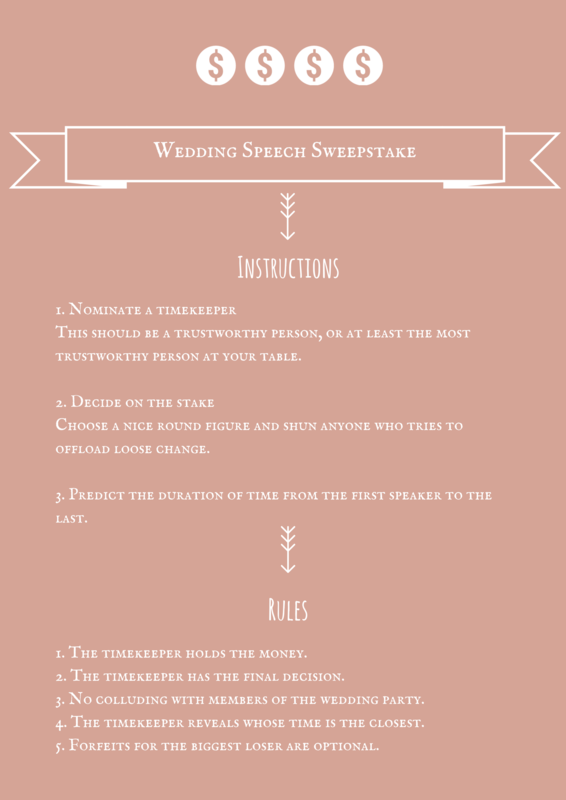 For a game that serves as both a talking point for your wedding tables and a fun way to create allure and excitement for your speeches, look no further than the Wedding Speech Sweepstake. This game simply consists of each guest at every table placing a bet on how long the speeches will last and the closest to the time wins. In our version of the speech sweepstake, you can also pencil in a few forfeits for the biggest loser!! Like these Wedding games but can’t find your colour? Let us know in the comments and we will try our best to arrange new template just for you! Further exciting wedding games for you to consider! There are so many games out there that can be played on your wedding day and act as the perfect ice breaker. If our selection of wedding game ideas within this post don’t quite tickle your fancy, then don’t worry, as we our wedding specialists have compiled a list of additional wedding game ideas that could evolve your big day! All these games are certain to put a smile on each and everyone of your guests faces. Furthermore, there’s still many more exciting and entertaining wedding reception games to discover. To learn more about captivating games that can compliment your wedding, make sure to read part 2! Keeping track of which stationary gets sent to which of your lucky guests can make your head spin! From Save the Date cards to separate day and evening cards, Bride&Groom Direct offer a stunning range of designs. As well as matching sets, you can easily personalise our wedding cards to match your unique and wonderful style! Make sure you plan your big day by researching the styles and themes of your wedding, view the wedding stationery collection. Are you having any gamed themed items at your wedding? Which of these game themed items suit you best?